Also, Brahms: Symphony No. 1. Jonathan Pasternack, London Symphony Orchestra. Naxos 8.572448. 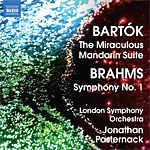 On this recent Naxos issue, the company oddly couple Bartok's Miraculous Mandarin Suite with Brahms's First Symphony, trying to make a connection between the two works by saying they are both "revolutionary." If you can forget the tenuous relationship and just enjoy the music for itself, you may be better off. Bela Bartok (1841-1945) premiered his Miraculous Mandarin pantomime (ballet) in 1926 in Cologne, Germany, where the mayor immediately banned it on moral grounds. The story line, you see, involves a pack of hoodlums who force a girl to seduce men up to her apartment, where the gang attempt to rob them. In its purely orchestral treatment as a suite of music, however, shorn of its visuals, it gained popularity. Certainly, the piece is highly descriptive, mimed on stage or not. It's also abrasive, jazzy, mysterious, sinister, and exciting, making for an entertaining twenty minutes or so. Maestro Jonathan Pasternack and the LSO appear to relish the atmospheric nature of the material and do their best to emphasize the contrasts between the quieter moods and the more clamorous ones. The conductor builds the suspense nicely and then cuts loose with some strong histrionic attacks that can be downright scary. You'll also find elements here of Stravinsky's Rite of Spring, particularly toward the end, which can only improve one's appreciation. Johannes Brahms (1833-1897) wrote his Symphony No. 1 in C minor, Op. 68, in 1876, and I suppose it really was "revolutionary," at least for him. It was one of the first true symphonies anyone had written in ages, and Brahms patterned it after Beethoven's work, leading waggish critics of the day to dub it Beethoven's Tenth. In part, Brahms's rival, Richard Wagner, had discouraged composers from working in the symphony genre, saying in effect that Beethoven had already done everything that a composer needed to do in the field and that the music drama and symphonic poem were now king. It sort of intimidated Brahms (and others) for many years. Anyway, Pasternack offers us a thoroughly charming, gentle, though entirely big-scale First Symphony, with practically all the poetry, drama, and thematic evolution from darkness into light one could hope for. The whole thing starts out slowly, almost ponderously, develops incrementally, and ends in exultation and joy. No, Pasternack didn't inspire me the way Klemperer (EMI), Boult (EMI), Abbado (DG), Jochum (EMI), Walter (Sony), Haitink (Philips), Kertesz (Decca), and others do, but it's an acceptable substitute. Naxos recorded this 2011 release at Abbey Road Studios, London, in July of 2008. The sound is pleasantly warm, soft, and smooth, which works fine in the Brahms, although the Bartok could have used more bite. While there are occasional traces of orchestral depth, the sonics generally content themselves with a wide stereo spread and an easily listenable midrange. Deepest bass and ultimate transparency are only moderate so audiophiles may not be entirely happy with those aspects of the recording, but the timpani in the Brahms tap out gleefully, with solid impact, so all is reasonably well.